Carter Weed has been providing lawn care for over 18 years. We continue to set high standards for ourselves so that our customers receive the best possible service. Our technicians are knowledgeable of the latest in lawn care techniques, which enables us to customize effective treatment plans for every situation. We are dedicated to providing fast, efficient lawn care. Our services are licensed, insured, and guaranteed. Called Carter Weed and Pest Control to spray our overgrown weeds. And they responded quickly and with reasonable price. Mind you we have six acres of land on our business. The weeds are slowly dying it's only been a week so far. I've referred them already to our neighbors. The office and the two gentleman that showed up here were so pleasant to talk to. I would pass on their name to anyone. Professional- Polite & reasonable.I would give them ( five stars ) excellent. It has been only a week and the yard looks great. Thank you. 5 star excellent. Great service! Great, stress free warranty! been very impressed with the services provided. I have been using Carter's for a few years now for weed control services on my acre property. They are well priced and they guarantee 6 months no weeds and they have proven to me they keep their word if weeds come back within that time frame! I love their customer service! Wonderful company! Been using them for years and have been very happy with their service. Great company to work with! We have been customers for both weeds and pest control for 5 years. Would not use anyone else. Great job and awesome customer service which is hard to get sometimes. Thank you!! They are always on time and if needed come back out for retreat with no problem...great customer service. We have had some weeds growing away from plant area (during the last big rains) assuming this has come from mainly the rains. We'll see again in April when we are there again. Hi Gail. Thank you for your feedback. We have had quite a bit of rain, I will send a tech by to touch up the weeds near the planter this week if we have access. Thank you! I don't use Facebook and the Google+ link is busted but I will say here I am very pleased with both customer service and interaction from the office as well as from the employee who serviced my property. I look forward to a long relationship with Carter's for my weed control needs. Thank you Jennifer & Tyler. The team at Carter Weed Control are always prompt and courteous. I can call and usually get service within a couple of days. I've used Carter Weed Control exclusively for many years and never had any problems. prompt, on time, and effective. Good customer service. Happy with all aspects of the service provided by Carter weed control. Thank You. 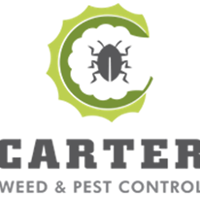 Carter Weed and Pest Control is a great company! They're super friendly, thorough, and knowledgeable. They stand behind their service, easily reachable, and accommodating, too! The weed killer did not work for a long period of time. It did finally start to kill off the weeds but due to rain and the weather I have no idea if it will last for any length of time. More time is needed to tell if the product will really last the six months they say it will. Hi Robin! Thank you for your feedback. It has certainly been a rough month with the rain and extreme cold (for us!) temperatures, and that can slow the efficacy of the material in killing off existing weeds. While we can't control things like weather and rain, we always warranty our service for 6 months and are happy to come out if you have any weeds that come back at no additional cost. Please contact me if you have any concerns at all. Thank you! This is a great company all staff are friendly and helpful and they say service is good for 6 months for me it works longer so I am very pleased with the service you guys rock ! Carter takes care of my Weed’s, pest and termite control. Love the service and customer service at reasonable prices. Service was prompt and done same day called. Service guy was polite and courteous. Scheduling an appointment or getting questions answered is friendly and quick. You do a great job taking care of our weeds and pests. I should have done this a long time ago. So thankful to found Carter Weed and Pest Control! They were excellent and quick in communication and responding and made it very easy to treat our weeds. Thank you! Friendly, conscious, thorough... you guys really set the bar! Good work, good price, good follow up ... a good job all around! I've always had good results and you have always came back if any weeds have shown up in between the next treatment. Weeds are in remission! Thanks so much. Merry Christmas 🎁🎄. My weeds are all dying and I really appreciate how the gentleman covered every inch of my weed ridden yard. Thank you and I’m pretty sure I’ll see you in 6 months 🙂. I am very pleased with Carters! The employees from the office staff to the techs in the field are all friendly and professional. When I have issues between the primary weed applications they are responsive and come to my house to reapply within a couple days. Great company for weed services! Sprayed for weeds thoroughly. Both post emergent and pre emergent. Great price and very professional. Yes, I am happy; however I noticed a weed this morning in the front, and the lawn was just serviced about one week ago. Always a pleasure to do business with Carter Weed and Pest Control. They do a great job, guarantee their work and always get back in a timely manor! Great work and completed as stated. Thank you. Excellent service...came on time and sprayed and were on their way...always happy to have Carter Weed do the spraying for the weeds as it actually works! Always do a great job, polite, friendly and professional! Have been a customer since we moved to San Tan Valley 5 years ago. Would highly recommend!! very happy with the service i wil continue to use this service as long as i have weeds. Jennifer was great on the phone every time I called and helped me every step of the way. They showed up on time and the weeds were gone 3-4 days later ! Thanks.